In case you all don't know yet, (if you care enough anyway, you fecking kaypohs) Icanhascheezburger's one of my favorite websites at the moment. The website's subject? Cats, one of my more favored animals, despite being a "stupid animal who only comes to you when it needs something from you", to quote from a friend. Well, Artists & fellow Artists-Wannabes like myself, here's something you should be interested in. 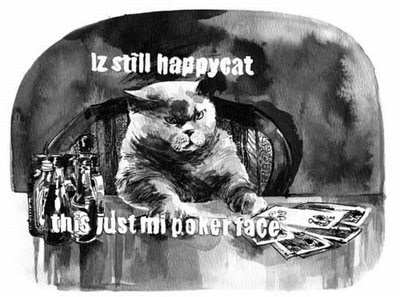 They're calling for LOLCat Art Submissions! They're accepting 2D, 3D or animation work as well. It'll be much better if you go to the website for more details. I've already have an idea for a digital illustration. YAY. Will carry out illustration, whether or not the proposal gets chosen. More of that soon!